Inspiration 9--Comprehend. Create. Communicate. Achieve more. Build thinking, creativity and communication skills to achieve more. For visual mapping, outlining, writing and making presentations, use Inspiration 9, the ultimate thinking and learning tool. Brainstorm ideas, structure your thoughts and visually communicate concepts to strengthen understanding with the Diagram and Map Views. To take notes, organize information, and structure writing for plans, papers and reports use the integrated Outline View to focus on main and supporting ideas and to clarify thinking in written form. With Inspiration’s Presentation Manager, transform your diagrams, mind maps and outlines into polished presentations that communicate ideas clearly and demonstrate understanding and knowledge. 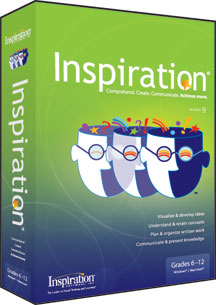 Build a strong foundation for thinking, comprehension and communication with Inspiration! Inspiration makes it easy to create webs, idea maps, mind maps, concept maps, graphic organizers, process flows, and other diagrams for thinking, organizing and writing. Use these proven visual thinking and learning techniques to brainstorm ideas, explore and explain relationships and integrate new knowledge with what you already know. Inspiration encourages deeper, more critical thinking and that improves creativity, comprehension and retention. Communicate what you’ve learned with Inspiration’s Presentation Manager. Use the content you’ve developed in Diagram, Map and Outline Views and expand your work into more thoughtful and compelling presentations and final projects. Inspiration provides all the tools to create organized, polished, formal presentations that convey ideas clearly and demonstrate your understanding and knowledge. Use the Inspiration Presenter to show your presentation easily on any Macintosh or Windows machine.